When Opt was spoiled for Modern, I wrote a piece about how I didn’t think the card would see much play. That didn’t stop me from putting together a bunch of decks with the card. 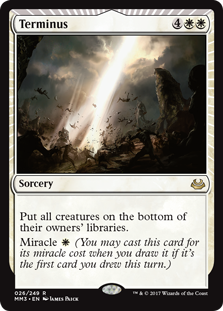 During those experiments, I took a literal “walk” on the wild side, following a tangent deep down the rabbit hole of Magic‘s most iconic new-frame keywords: miracle. “Scry 1; draw a card” isn’t a very exciting effect. Tacking on “take an extra turn after this one” certainly changes that. 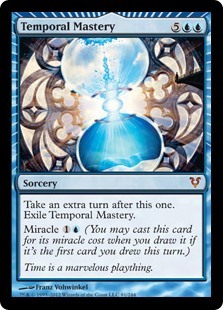 We can cast Temporal Mastery for its miracle cost after Opt finds it on our opponent’s turn, giving us multiple shots to get extra turns on the cheap between their end step and our draw step. But can the card work in Modern? Read on to find out! Okay, level zero. We’re building a deck around taking extra turns. So what are the things we only get to do once per turn? If we manage to construct a deck that does many of those things, the extra turns we take might actually reward our efforts. The first two aren’t tough to build around at all—every deck enjoys drawing for turn and spending its mana. Next! Combat is something certain decks avoid entirely (Ad Nauseam), or at least functionally (Valakut); others would love an extra attack step (Zoo). We’re on to something with this one. Making a land drop falls into a similar boat: there are decks that play fine off three lands, like Grixis Shadow, and others that simply won’t beat you unless they can pay to activate their Celestial Colonnades. “Once per turn” clauses are rare in Magic, compared with, say, Yu-Gi-Oh! ; the reason is that tacking mana costs onto activated abilities keeps them from being abused too often in a turn. But Magic still has cards that tap to activate their costs. One card type that does so functionally is planeswalker, which I do think is worth exploring with Temporal Mastery. I couldn’t find any explicit “tap” cards in the Modern pool that are worth building around Mastery for. The first place I started was with old faithful, Temur Delver. Since I already wanted to run plenty of cantrips, including Mishra’s Bauble, Temur seemed like a great launch pad—Bauble synergizes well with many of the cards here, and if any deck wants to take extra turns on the cheap, it’s the one with low-cost threats. Referring to our list above, Temur maximizes the second combat step and free-mana dimensions of an extra turn. I built the deck with eight one-drops to maximize the impact of an early Temporal Mastery. Leading with Delver, Swiftspear, or Tarmogoyf and then happening to draw the miracle on turn three would pile damage on to the tempo gained from an extra land drop or free mana for a cantrip, putting us even farther ahead. Mishra’s Bauble also plays tons of roles in this deck, as it did in my original Bauble-featuring Temur shell, Banana Phone. On the surface, the artifact allows us to draw a card on the opponent’s turn, potentially triggering miracle. But it does more, too. Bauble triggers prowess on Swiftspear, fills the graveyard for Tarmogoyf and Hooting Mandrills, helps flip Delver by giving us multiple looks at our top card, and of course offers incidental deck manipulation with Scour and fetchlands. Faithless Looting is a card that might seem weird at first, but my love for this oddball cantrip knows few bounds. It seems like the best option for dumping Temporal Masterys we open or accidentally draw into during our main phase, as it’s cost-efficient and we can flash it back after milling one with Thought Scour. Looting can also grow Goyf astronomically in non-interactive matchups like Valakut or Tron, making a quick 5/6 with which to beat some face, or power out Hooting Mandrills in a pinch. While it doesn’t pertain specifically to a Temporal Mastery-wielding build of Temur Delver, Hooting Mandrills is also just the stone nuts right now. It’s nearly impossible for many decks to remove, comes down quickly, and ignores chump blockers on offense. I’d say it’s the best creature in Counter-Cat and one of the better-positioned creatures in the format generally, beating out even Tasigur, the Golden Fang and Gurmag Angler thanks to trample. One problem with Temporal Mastery in this deck is that we don’t get to play a lot of cards integral to the Temur Delver strategy because we lack room. Mana Leak is crucial to our plan against big mana, for instance; Disrupting Shoal and Spell Snare work wonders against linear aggro decks. Mastery is a high-variance card that doesn’t address any specific problems, and playing it forces us to abandon the answers we run out of necessity. I ran into a lot of tension between miracle and Monastery Swiftspear. The prowess creature incentivizes us to cantrip as much as possible during the main phase, which we are happy to do since we don’t play two-mana counterspells. But cantripping in the main phase makes Temporal Mastery a lot worse, as we’re likelier to draw it. I think Serum Visions is something of a necessary evil when it comes to miracle—after all, it sets up a trigger better than anything else in the format. But the other cards we use to draw on the main phase—Opt, Scour, and Looting—increase our odds of drawing a dead miracle. Of course, the alternative is to attack for almost no damage. Neither plan is very appealing. A solution I toyed with was to simply run Wild Nacatl over Monastery Swiftspear. But every build I tried ended up being a worse Counter-Cat. No matter what I cut to make room for the Mastery package, I missed it: Shoals, Paths, Leaks, Snares, Sleights, you name it. Not to mention Opt is quite bad for Counter-Cat, and for strategies that want to cantrip on the main phase in general (one of the main reasons I don’t expect it to see much play). I decided to try Opt-Mastery in a deck lighter on attack steps, but which could take advantage of another benefit of extra turns: making more land drops. The burn-heavy Jeskai Tempo lists running around operate primarily at instant speed, making them intriguing as possible homes for the package. Once we open a hand without Masteries, the opportunity cost of having them in the deck is very small. Sure, we need to sequence our cantrips a little differently with knowledge of the sorcery, but it’s common to get an extra turn or two in longer games for virtually no cost. When we have lots of lands to play, or mana lying around to cast more cantrips or removal spells before untapping again, that extra turn does put us far ahead. I also once had the pleasure of ripping Mastery on eight lands, which translated to a free Colonnade attack that allowed me to deal a lethal 11 damage more or less on the spot thanks to a sandbagged Lightning Bolt. Besides Opt, this deck runs Remand and Cryptic Command to set up draws on the opponent’s turn. Both of these spells are sometimes clunky with miracle, as it happens that we need to counter something and won’t have the mana to Temporal should we draw it. But this problem mostly comes up with Command, and even then, the odds are against it occurring; once we stabilize the board around turn four, it’s generally easy to cast the Masteries we draw as we find them. Unlike Temur Delver, Jeskai Tempo can actually hardcast Temporal Mastery in the late-game it often aspires to, making Faithless Looting unnecessary. The weirdo card in the sideboard is Spell Pierce, which I love in all my controlling Ux decks these days. It’s just nutty against spell-based anything, where it retains targets deep into the game; even lol-I’m-flooding piles like, uh, the Jeskai mirror have turns where they animate Colonnade and tap out for Logic Knot, or try to Snap-Command something. Pierce is also super good against Collected Company, where it often catches them off guard and frequently lets us lock up the game (CoCo players are quick to cast their namesake card in the main phase if we don’t have two mana up, since we might just have Dispel anyway and leave that up for the whole game; even once they learn of Pierce, I haven’t found that they play around it). Land drops are all well and fine, but losing out on attack steps is seriously saddening. I took a good deal of extra turns with this deck where all I’d net out of Mastery was a free land drop or draw, which was not what I needed. Queller and Snap simply weren’t around enough to let me reliably extract damage from the miracle. It’s interesting that something like Time Walk really is more broken in Vintage than it would be in another format, since Vintage players actually have enough mana and efficient spells as of turn one to make good use of an extra turn as soon as they can resolve it. At this point, there was a once-per-turn resource I hadn’t yet tried to abuse with Temporal Mastery: planeswalker activations. My stab at an Esper shell sought to combine Delver’s combat steps and Jeskai’s land drops with a band of up-ticking superfriends. This deck did an okay job of addressing the problems of the last two—Lingering Souls, Snapcaster, and Tasigur form the “combat” squad, and Esper Midrange is, well, midrange-y enough to want to make its land drops. Esper also afforded me the opportunity to try the new planeswalker rule, although, with just one spare Liliana, it didn’t come up often. I wanted that Liliana to reliably recur a creature, but don’t play enough to justify multiples. The Last Hope still plugs holes in of the Veil’s approach to board control, and I love having the two on the board together against creature decks. The deck’s most exciting planeswalker, though, is Jace, Vryn’s Prodigy. Jace’s looting effect is very relevant here: it dumps extra Masteries, or Souls for a cheap flashback cost; recurs our important spells; and draws a card on the opponent’s turn, potentially triggering miracle! Maxing out on Jace lets us finally trim some copies of Opt, which I still believe is a pretty sorry cantrip. As with my Esper Vehicles list, this deck really wants to have multiple planeswalkers in play. It’s hard for fair decks to beat us when we can pull that off. But I skipped out on Gideon of the Trials here, which is definitely a great card. Trials excels in a shell with sweepers, which would clash with this deck’s gameplan. I also didn’t want to stretch my mana too thing, and was therefore wary of anything costing double blue or white (Liliana of the Veil is insane enough to earn an inclusion regardless). Esper Midrange runs into the same problems other non-Shadow midrange decks have in Modern: it’s too inefficient and clunky to keep up with Tron and some of the more linear decks in the format. Abzan, the best of the bunch, has made up for this shortcoming enough with its positive Shadow matchup to retain a respectable metagame share hovering around 4%. But the same can’t be said for other black decks of its ilk. Since this deck is more focused on synergy with its walkers and Masteries, and especially soft to Fatal Push thanks to Jace, Vryn’s Prodigy, I don’t anticipate it even having a great Shadow matchup, which combines with Esper’s other issues to make the whole shard kind of unplayable. Search for Azcanta is another once-per-turn effect that increases the value we get from extra turns. I only even transformed it once, thanks to Tasigur eating up the graveyard, and even then its three-mana Impulse mode is a bit slow for Modern. Scrying once per turn and dumping cards is okay, and synergizes with Mastery, but it’s not worth two mana. I pegged this card during spoiler season (but, out of doubt, omitted it at the last minute from my spoiler review) as a possible include in decks looking to go longer that are strapped on mana, such as this one. After testing, I think both its sides are too low-impact for the cost. 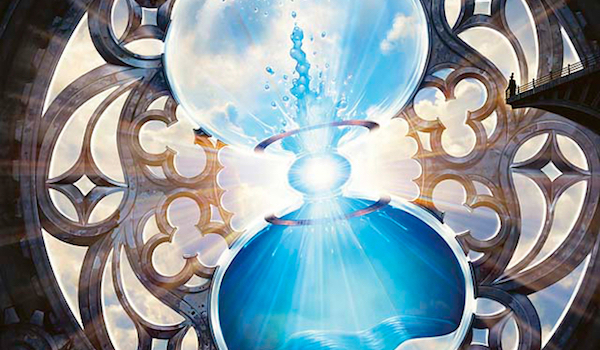 As always, hindsight’s 20/20—why would Temporal Mastery make it in Modern if it never saw play in Legacy, a format that for years was dominated by a miracles deck packing enablers as potent as Sensei’s Divining Top, Ponder, and Brainstorm? That deck gets its name from Terminus, a card that plugs a hole in the Counterbalance-Top strategy. My brewing mistake with these Mastery decks is that I set out to build around a specific card, without giving much thought to the archetypes I slotted the card into—whether those decks wanted such a card in the first place; what problems, if any, the card remedied; which threats, if any, Mastery posed to their integrity. Brewing in this way does have one major benefit: it helps us find an ideal shell (or close) for a certain card, which allows us to say with the certainty of experience why a certain card, or decks built around it, aren’t playable in the format. I’ve learned the hard way that Temporal Mastery just isn’t right for Modern. But best of all, I know why. Are there any cards you think might work in the format, but are virtually unplayed? Let me know in the comments, and if the card piques my interest, it might get a case study of its own! Yeah, punisher cards are more of a known trap at this point. Even if you’re bringing Devil back with Claim, opponents can still choose to kill it for 4 life. It’s often just better to reanimate (or regularly cast) a Shadow. It certainly becomes more consistent, but Lantern doesn’t have much to do with an extra turn. Terminus isn’t great there either since it’s also off-color and clashes with Bridge. I think Tamiyo, Field Researcher should be played far more heavily than she is. I think the biggest issue with her is that there just arn’t any good Bant decks right now. There just isn’t a good reason to play blue in modern unless you’re turbo-xerox. Still, perhaps a value-heavy Bant deck could go somewhere. Snap, goyf, and path combined can’t possibly be that bad, and I imagine that curving queller into Tamiyo would put away a lot of games. I love her in my Counter-Cat deck! She has been an all-star from the sideboard since we added her. Very interesting article, as a teacher I’m always trying to help my students understand that the best way to learn what works is to try and find what doesn’t. It’s nice to see that concept come to life in Magic. I did have a question about a few cards that seem to be flying under the radar, and I wanted to get your take on them. Delay: The decks that “want” it generally prefer cards that advance their gameplans, or disruption that’s more reliable. Something like Spirits is going to have trouble putting the game away before the spell comes off suspend a lot of the time. Queller is a lot better in this role for many decks since it’s more versatile and also proactive. The ‘turns’ deck (or decks, it’s a bit divergent) is fringe but competitive. I realise the purpose of this article wasn’t to do a deck-tech and I assume you know of the deck’s existence, but at the least a minor nod to the archetype seems appropriate here, even respectful maybe. Otherwise good article. I appreciate brewers trying new directions and selecting cards a bit off the beaten track. I actually think that deck is quite bad. Compare it to another linear combo deck, Ad Nauseam: It takes a turn or two longer to get online, has less incidental interaction for the opponent (Grace and Unlife happen to be nuts against certain strategies), is less consistent since it doesn’t run as many cantrips, needs to assemble more pieces to go for a kill, and is prone to fizzling out. I kind of feel the same way about Gx Devotion: it’s slower than other linear combo decks and boasts a worse payoff. I have found that the best builds of this deck splash for 4x Moon in the main, which lets them cheese games against decks they otherwise are too slow and fragile to beat. Of course, Moon turns off Nykthos. And at that point you might as well play Ponza—resolving Inferno Titan is more or less as good as resolving a huge Genesis Wave in Modern. There are lots of decks in Modern that are playable at the local level but not on the competitive scene because they simply lack an obvious element compared with an actual deck—they’re a turn slower (like the above examples), they’re card-for-card less efficient (like my BUG Rogues brews), etc. That doesn’t mean they can’t be fun or interesting, but I personally am less interested in most of these decks because I have tried iterations of them myself and come face to face with their shortcomings already. “Respecting” a certain deck by name-dropping it is a really fascinating concept, though. I do name-drop decks when I think doing so will contribute to my piece, often by giving readers a reference point or anticipating certain reactions. I can see mentioning the Turns deck as part of the latter. But to think a deck is “deserving of respect” enough to be shouted out whenever one of its key cards is mentioned seems a little weird. I know it’s hyper-tangential, but would you care to elaborate on what you mean by that phrase? I was referring to your implication that modern hadn’t really seen the use of Temporal Mastery before. I’d like to have seen some acknowledgement that the card does indeed have a consistent home in modern. Better still, as you (as a brewer) are in the business of fringe strategies or themic brews, I’d have gladly welcomed a comment from you saying why you didn’t think Turns was very good or worth considering. It would have… added to the richness of your article, shall we say. In terms of respect, it really wasn’t for the deck that I was implying. It was more for the players that have similarly been trying to give this specific card a home in modern and have sunk in countless hours tweaking and testing at all different levels of competition. In an article about this one card where you make sweeping conclusions as to whether it’s “good in modern” it behoves you to make some kind of comment on other people’s efforts, even if your comment is to criticise and set a benchmark for how you intend to do better. Your own brewing or testing doesn’t exist in isolation, was my point, and even a passing mention of turns (negative or positive) maybe at the beginning of the article, would have added more weight to your direction and commentary. I hope you don’t think this too scathing. I just feel it’s important to acknowledge stuff like this even if it’s to pass criticism. It makes your piece stronger I feel because it shows attention to detail and understanding of the format. Os that fair? That’s totally fair and was an oversight on my part. I agree that it would have added to the article. Turns players: you have indeed been playing with Temporal Mastery! I appreciate the reply. Thanks for a good article Jordan! Sultai with Search for Ascanta, Revengge of the unted, New Nissa, Grim Flayer. Also testing with Noxious revival…so there is some plan to scry and manipulate the top, but also to bin miracles from hand and put them back. Its a big puzzle that I think can be solved and as cards like Search and Nissa and Opt make their way into modern someone is going to break miracles…I just inf it overwhelming to brew in the format. My advice is to try anyway! After a few drafts I bet you won’t find it as daunting. And who knows, you might stumble upon something exceptional in the meantime. I’ll keep working at it. Although Grim Flayer is a bit slow, I find he does a lot of what the deck needs…he can apply pressure, he can find answers, he can stack miracles, he gives another value effect on resolved masteries. Maybe mastery card goes into onto the Sultai Delerium deck that was running around with new Emrakul a while back…or somewhere closer to a Sultai Shadow deck. Fits the theme anyways…one rules question I have is what happens exactly when you cast Temporal Master on opponents turn? You get an extra turn after that turn. Then the regular turn cycle continues, which in this case means you take your normal turn.